Experience a bit of the Old West! 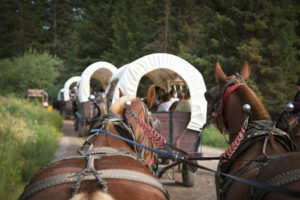 Hop on a covered horse drawn wagon ride for a 2 mile trail ride, followed by a delicious Dutch oven cooked dinner and live western entertainment! Two dinners/shows are offered Monday thru Saturday (closed on Sundays) with either a 4:45 p.m. or 6 p.m. departure. Prices are $48 per adult and $40 per child (5-12 years), toddlers and infants are free. Price includes wagon ride, dinner, show and sales tax. Gratuity is not included. Advanced reservations are required and there is a 72 hour cancellation policy. Alcohol is not served or permitted. All chuckwagon dinners have a 72 hour cancellation policy (unless otherwise noted) and are subject to a 20% cancellation fee.